An upgraded version of our HDC6EDID. Now with local HDMI loop out on transmitter device enables local viewing function. Which means you can view the video source locally as well as on the extended end. A neat and simple high definition HDMI extender kit. This kit extends your high definition AV sources from Blu-ray DVD Players, PS3 and XBOX etc. up to a maximum 50m via single solid CAT5E/ 6 cables through the wall cavities. The new EDID feature increases its compatiblilty with players or displays. It supports full 1080P high definition and integrates an infra-red control extender for full controllability from the receiving end. RJ45 connections on the rear of both units make it for easy connection. 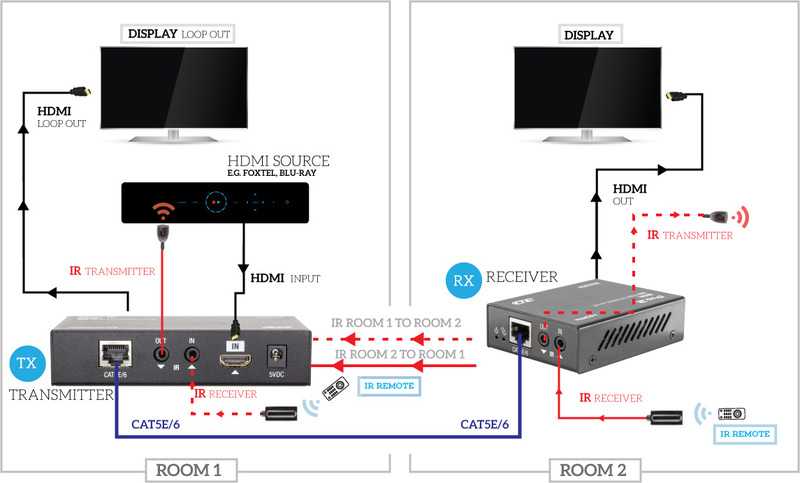 Transmits HDMI Audio/Video Signals and IR over a 50m single solid Cat5e/6 Cable. Transmits a wide-band Bi-Directional IR control signal together with the HDMI signal. Full cascade to create larger distributions. Follows IEEE-568B cable termination standards and solid cables are prefered. Please note: IEEE-568B standard solid cables are recommended for this kit. *Note: 50m distance is under perfect transmission conditions including straight cable runs with no electrical interference, bends, kinks, patch panels or wall outlets. Does this unit work with the new Foxtel iQ3? Yes. Just make sure your IR emitter is placed in the correct location. See the image below. Also note that the new Foxtel IQ boxes only come with a Bluetooth remote. You will need to acquire a Foxtel compatible IR remote. What happen if the product is not working? Please check your cable. Make sure IEEE-568B type solid cable is being used.